This is a first for Cheriton. We are really looking forward to the next installment of the Cheriton Artland programme, which continues in 2013 with a weekend festival of light and fire. Over two consecutive nights on 23rd and 24th February the Kent Garrison town of Cheriton will become the must see destination, where a programme of new artworks will be displayed in the centre of the town for everyone to experience and enjoy. International artists will be working with Strange Cargo to deliver this event, including Ross Ashton, Karen Monid, Tine Bech, Andrew Baldwin and Greg Stobbs to name just a few. 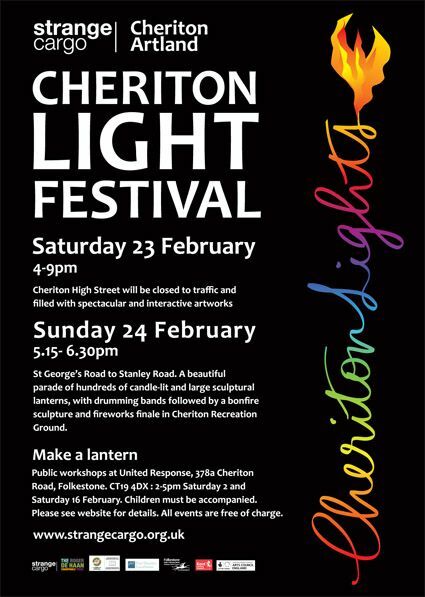 From 4pm to 9pm on 23rd February, Cheriton High Street is the place to be seen. Wrap up warm and come along and join in this great free event. Then come along again on the next night and join the whole community in a beautiful parade of candle lit lanterns to the Recreation Ground where a sculptural bonfire awaits. From 5.15pm a procession of over 300 candle lit paper pyramids and beautiful sculptural lanterns created by local young people in workshops will set off, reclaiming the streets of Cheriton for the night for people. Serenaded by the amazing rhythms of international drumming bands Batala and Bloco Fogo, who will be pounding out their rhythms to carry the parade from along Cheriton High Street to the a finale in Cheriton Recreation Ground. The audience will be treated to the most spectacular finale, braving the chilly night for a giant sculptural bonfire in the form of a Phoenix, built in the grounds of the park - awaiting to be burned amidst a cacophony of drums and fireworks. The event has been supported by Arts Council England, Roger De Haan Charitable Trust, Paul Hamlyn Foundation, Interreg European Funding, Shepway District Council and Kent County Council. The Cheriton Lights Festival was selected under the European cross-border cooperation programme INTERREG IV A France (Channel) - England, co-funded by the ERDF.